I just received my first order of ‘Moo Cards’! What’s a ‘Moo Card’? Well I had to ask too. They are tiny business cards, that a company, http://www.moo.com/ makes, using your own pictures. They are so fun, I will be including them in purchases from my etsy shop. I am going to keep adding to the collection. Included in my first shipment are snippets from artwork that is being published in the near future. 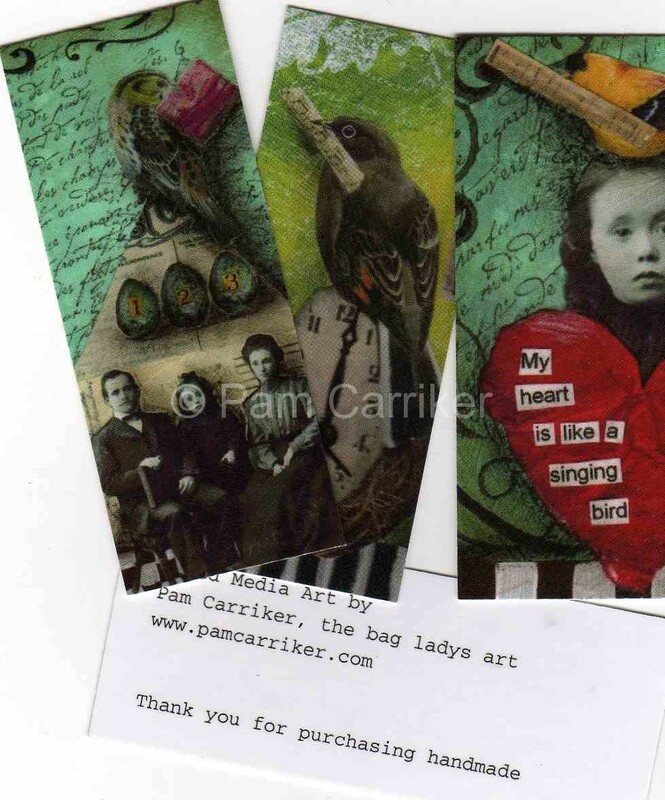 I have decided to use my published work for these little calling cards. On the back I have my contact info and ‘Thank you for purchasing handmade’. I think it is so important in these times to try to boost our economy by purchasing things made in the US. So get a Moo on and go check out their site! P.S. To see the full version of these works, check out the Stampers’ Sampler, August/September guest artist feature! Don’t you just love MOO cards? I discovered them last month and also add them to etsy purchases. I found your blog through Gail’s blog and wanted to thank you for your vote on my Remembrance box. I love your Art and now I must buy the Paper, Scissors…..to read your article. Way to go!!! !I love that you wrote it from your heart, those are the best. Magazines are pricey these days, so I tend to stick with my usuals unless someone points out their work in one. Can’t wait to buy it. Keep creating! Moo cards are such nice quality, too..they really are great. I need to get some, too! !Love the styles you’ve created–very nice! Another great site and another great share! They are adorable. I love them, I am ready to do more. Such a clever invention and people love to get them.